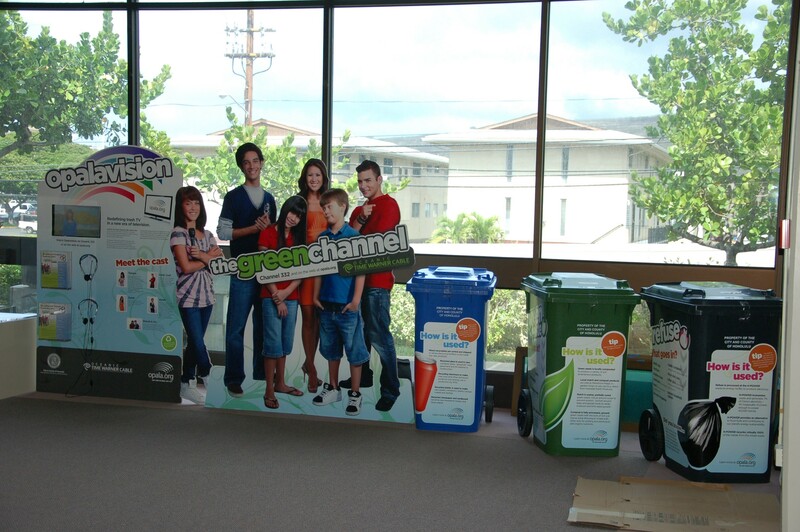 An award-winning educational recycling display by the City and County of Honolulu’s Department of Environmental Services, is currently on an island-wide tour of 10 selected Oahu public libraries. The Green Channel “Opalavision” display, which earned an Ilima Award of Excellence from the International Association of Business Communicators (IABC), will be available for viewing in November at Aina Haina Public Library, and at Wahiawa Public Library in December. This library tour kicked off in March at Kapolei Public Library. The display has also visited the Hawaii State Library, Kaimuki Public Library, Pearl City Public Library, Waianae Public Library, Waipahu Public Library, Liliha Public Library, and Salt Lake-Moanalua Public Library. 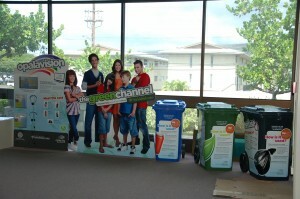 The display features the new curbside recycling carts and life-size representations of the cast of “The Green Channel,” a new interactive, digital television channel on Oceanic Time Warner Cable 332 and online at www.opala.org. A portion of the interactive display includes 3-minute videos featuring a cast of hip and opala-savvy young actors who take viewers behind-the-scenes through the world of Oahu’s recycling and waste management systems. Visitors to the display can watch episodes of “Opalavison” and have a photo taken alongside the life-sized cutouts of the actors. To complement the display, the Department of Environmental Services donated $5,000 worth of children’s and adult books to the Hawaii State Public Library System including a set of 19 books for each participating library. Recycling has become more and more prominent in our lives today. Taking care of opala is everyone’s business. Oahu’s curbside recycling program is available to every household.